Hairy Maclary from Donaldson's Dairy, by Lynley Dodd. 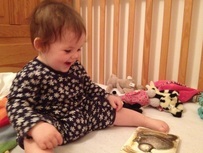 This has been Amelia's absolute favourite book since she could hold a book herself, so around six months I suppose. She loves leafing through to see each type of dog on each page, and laughs, without fail when we reach the page with Scarface Claw! 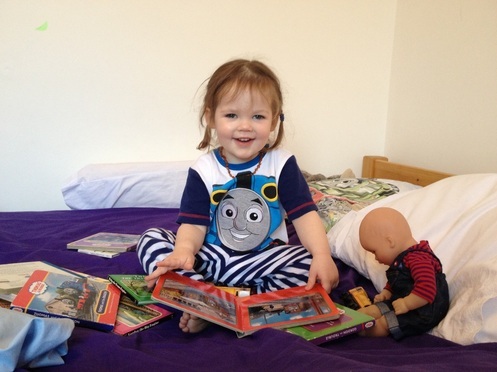 She likes the sound of all the wonderful names, like Bitzer Maloney and Hercules Morse, and the metre of the whole story makes it lovely to read, and easy to memorise. 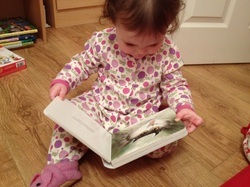 I can now read it to her off by heart while she turns the pages herself. The illustrations are delightful and each animal has such a delicious character to go with their fabulous names. This is just one of many titles available by Lynley Dodd in the same series. A few of our other favourites include Slinky Malinky and Zachary Quack! They are available as board books (see picture) but also as paperback picture books. We also have the mini library, which has four little stories in, each about a different character from the main books, which is handy to take out and about.